The Juanita's Hot & Spicy Menudo is prepared with the same care and quality ingredients as the regular Menudo but with the extra zest of chiles and spices. It has a lively taste perfect for any fiesta. Menudo is one of the most popular dishes in Mexico. This hearty stew is a meal in itself with tender beef tripe and Mexican-style hominy combined in a red chile broth. It is appropriate to serve any time of the day: breakfast, lunch, or dinner. Menudo is also a traditional holiday specialty and served at any festive occasion. Juanita�s Menudo is the NUMBER ONE selling Menudo in the United States. It is considered a staple in the Mexican food category. And no wonder, with it�s authentic homemade taste that can be enjoyed in minutes, rather than the many hours it requires to prepare in the home. Juanita�s only uses U.S.D.A. approved beef tripe. We only use salt and lime to process the dried white corn into savory hominy never using lye like other brands. All you need to do is heat and serve Juanita�s Menudo and garnish with diced raw onions, fresh sprigs of cilantro, a squirt of fresh lime, and sprinkle with dried aromatic oregano. Juanita's slogan says: From our cocina (kitchen) to yours. Menudo picante de la marca Juanita's preparado con tripa, ma�z blanco, cebolla, chile y especias. El Menudo Picante es preparado con el mismo cuidado e ingredientes de calidad que utiliza Juanita's Foods en la elaboraci�n del Menudo regular, solamente a�aden una cantidad mayor de chile y especies esto le brinda un sabor rico perfecto para cualquier fiesta. 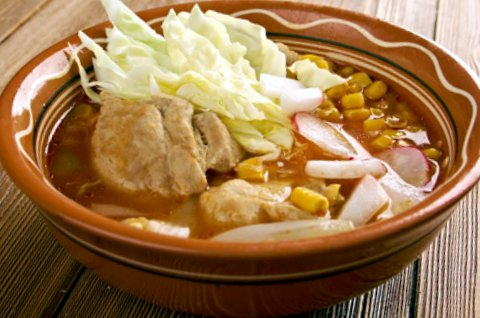 Menudo es uno de los platillos m�s populares de M�xico. Este guiso en s� mismo es una comida completa, preparado con carne de res tierna y grano de ma�z estilo Mexicano combinado en caldo de chile rojo. Es apropiado servirlo a cualquier hora del d�a: desayuno, almuerzo, o cena. El Menudo es tambi�n una tradici�n para d�as de fiestas en cualquier ocasi�n de festejo. 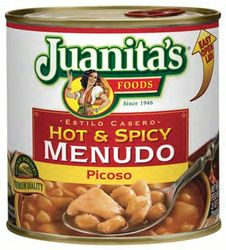 El Menudo de Juanita's es el NUMERO UNO en ventas de Estados Unidos. Es considerado como producto b�sico en la categor�a de comida Mexicana; un producto que por su sabor aut�ntico hecho en casa, puede ser disfrutado en minutos, en vez de las largas horas que son requeridas para prepararlo. Juanita's solamente usa carne de res aprobada por el Departamento de Agricultura de Estados Unidos. Solamente usa sal y cal para procesar el grano de ma�z seco y hacerlo sabroso, nunca usa hidr�xido de sodio como otras marcas. Lo �nico que tiene que hacer es calentar el Menudo Juanita's y servirlo y adornarlo con cebolla picada, cilantro, unas gotas de lim�n, y una pizca de or�gano. Menudo Juanita's de nuestra cocina a la de usted. Great taste and flavor! Good to get a product with homemade taste! Especially being deployed far from home! If I cant get home made, then I have to have Juanita's. Hard to find the ingredients here in Japan, so the next best thing is getting my shipment of Juanita's menudo. Delicious and a lot less work! I LOVE this stuff. It is one of my go-to foods on cold nights, and I always make sure to keep 2 large cans stocked in the pantry. Fresh menudo can be quite delicious, but there is just something about their spice combination with a nice chile kick that keeps me coming back. I even tried making my own menudo from scratch once, it wasn't as tasty as this and it was a LOT more work than heating up a can of this goodness! Try it, you'll like it! I used to get this in Walmart, but they no longer carry it, so glad we can still get it thru your company. ConsCans were really dented big time. They were well packed so it did not happen in shipping. That meant that it was put in the box that way. Not sure if that is the best way to treat customers. That was very disappointing. I love this brand and always keep some on hand for winter in case I get a head cold or just want so comfort food on a cold, snowy day. Best flavor ever. I'm from California but now live upstate NY and am grateful that I can get this shipped to me. ProsPerfect size can for a nice big portion, or if you feel like sharing. When you live in an area in the world where you can't find all the ingredients to make your own menudo, this is the best. We love it and have menudo every weekend. I love this menudo it taste just like my moms menudo...being pregnant I crave Menudo and these 29 oz. cans are so convenient for me. Thank you Juanita!